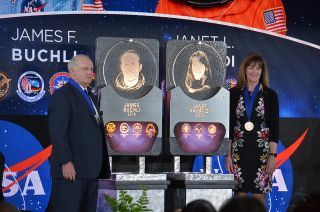 Astronauts Jim Buchli and Janet Kavandi were inducted into the U.S. Astronaut Hall of Fame during a ceremony on Saturday, April 6, 2019, under the display of the retired space shuttle Atlantis at NASA's Kennedy Space Center Visitor Complex in Florida. They unveiled their plaques, which will be placed in the Hall of Fame at the visitor complex. CAPE CANAVERAL, Fla. — Although their own space missions came decades after the first humans landed on the moon, Jim Buchli and Janet Kavandi have now joined the same ranks as Apollo 11 astronauts Neil Armstrong and Buzz Aldrin. New inductees Jim Buchli and Janet Kavandi stand among fellow U.S. Astronaut Hall of Fame members following their induction ceremony on Saturday, April 6, 2019, at NASA’s Kennedy Space Center Visitor Complex in Florida. "The thing that I think is really remarkable is that every one of the people who has flown into space, when it is there turn, they step up to the challenge and do it right. You can say that about Apollo 11, they stepped up to the challenge and did everything right, it was their turn to fly and they executed perfectly. And so when it is your turn, you do the mission that you're assigned to and you do it to the best of your abilities. I am just happy to be part of all of that," Buchli told collectSPACE.com. Click through to collectSPACE for more photos and video from the 2019 U.S. Astronaut Hall of Fame induction ceremony.